IKEA is promoting the line, “Easy to Assemble” with an online video series starring director Illeana Douglas and co-starring Jeff Goldblum, Tom Arnold, Justine Bateman, Jane Lynch, Craig Bierko, Kevin Pollack, Ed Begley Jr. and Robert Patrick. Twenty co-worker training videos, initially rolled out online on the SVX channels at YouTube and Metacafe, feature playful if slightly embarrassing moments for staff and guests at an IKEA store in Burbank, California. The campaign is supplemented by a specially designed site, www.easytoassemble.tv. “These spoof training videos really capture the flavor of the main episodes of ‘Easy To Assemble,’ which will be launched later this month,” said Thomas Bannister, CEO of SXM, the company behind the campaign. The first episode, Training Day, featuring American actress, writer and director Illeana Douglas was launched on Youtube and TV.com. Watch out for the Jane Lynch cameo. 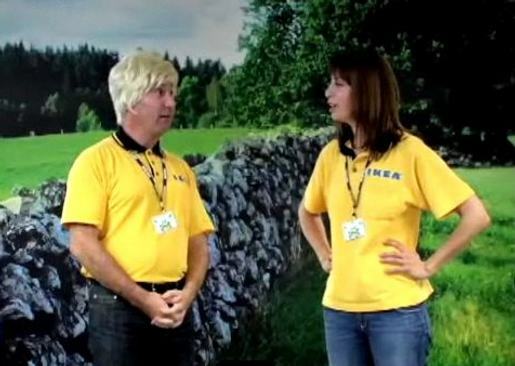 The following episodes provide off beat introductions to IKEA culture. Kevin Pollack provides training on greeting customers. Craig Bierko talks about using the Allen key. Tom Arnold waxes lyrical on preparing meatballs. Music for the series is Apples and Fish by Swedish band Sparhusen. After getting 300,000 views on Youtube in their first 5 days Easy To Assemble has been picked up by CBS. From Monday 29th September onwards CBS’s website TV.com will be exclusively broadcasting new episodes of the show. Easy To Assemble will be TV.com’s first foray into original entertainment content. The LA Times recently described Easy To Assemble as “in the vein of HBO’s The Comeback and Extras, finding comedy in the small and large humiliations of acting life”. Les Moonves, CEO of CBS, emphasized CBS’s new initiative of creating original web content at the Advertising Bureau’s Interactive Conference saying “the future of internet content is as a lab for the network”. The Easy to Assembly campaign follows on the tails of the 2005 online series, “Illeanarama: Success Is The New Failure“, in which Illeana Douglas gives up her Hollywood career to work in a local supermarket. However as word gets around that supermarket employment is the new fashion statment other celebrities start to materialize, including Jeff Goldblum, Jane Lynch, Ed Begley Jr and if you look hard enough Gene Wilder.